I’m out early this morning getting a four-mile power walk in….sans poodle. It’s poodle’s play day and he’s spending part of the day at Paradise Pet Resort (doggie day care). Much as a adore my four-legged best friend, I cherish the break from him now and then …much as a mother does from the demands of a toddler….or a snarky teenager. On this walk I am able to walk as fast as my cranky legs will take me without stopping for poodle to smell –and mark– every other tree or mailbox. It’s a beautiful morning; the sun is shining and the air is crisp-cool. Another morning without having to wear winter gloves and a coat…spring is just around the corner! A good half-hour into my walk I get a call on my iPhone, interrupting not only my Spotify mood buster playlist of upbeat, happy songs but also thoughts about my ailing parents. It’s the pest control guy; he’s calling to ask if he can schedule the monthly service for this morning. Though the drawl is southern, I note a different voice; it’s a different fellow than my normal serviceman, Shaun. I tell Jeff I imagine Shaun filled him in about the “crazy lady from California.” He chuckles and responds that he’ll be able to meet me in an hour’s time. “I love insects. In fact my undergrad degree is in Biology and my masters is in Entomology.” Impressive…I think to myself. This is good. He really knows bugs. He then adds that he raises black widow spiders. Say what?! Me: (Incredulous) You actually raise spiders? Me: Umm…should I spray YOU before you enter into my house?! Me: Um…so you love spiders and you raise black widows…. so…um…. just why are you in the pest control business? (Truthfully, now I am a bit skeptical that he’s going to do a good job of killing insects and other creepy, crawly things in my house. If I turn my back on him for a few seconds will he turn off the insecticide wand and simply pretend he’s killing in order to save an insect life? I’m just asking…..). I think I’ve got to talk to Shaun. Who wants to work for their father-in-law anyway? Jeff goes on to say that he has a lab in his home. “I actually study spiders and snakes,” he says. “I have a snake…so much to learn from snakes too… (OH GOD) ….and I am studying spiders to learn more about their venom and their cancer curing properties. “A cure for cancer….from spiders?” I ask. I’m starting to think this guy is borderline creepy and I wish I had my poodle at my side. “Yes,” says Jeff. I am interested in black widows because there is something unusual in their DNA; I am trying to investigate why black widows are always black and they always have the red hour-glass. They never mutate; not even in the slightest variation…they always look the same. We don’t know much about their molecules or their evolution. They never change unlike other arachnids and crustaceans. He then goes on for a time about spider’s webs and spider silk and developing technology to make use of their webs for surgical purposes or use in military apparel. “Spider silk is stronger than Kevlar,” he says. I later look up his cancer cure claim on-line. I select one site and wouldn’t you know…. Spider venom has been studied as possible treatments for many diseases. It was found that solutions of very small spider venom could inhibit cell proliferation of lung cancer. 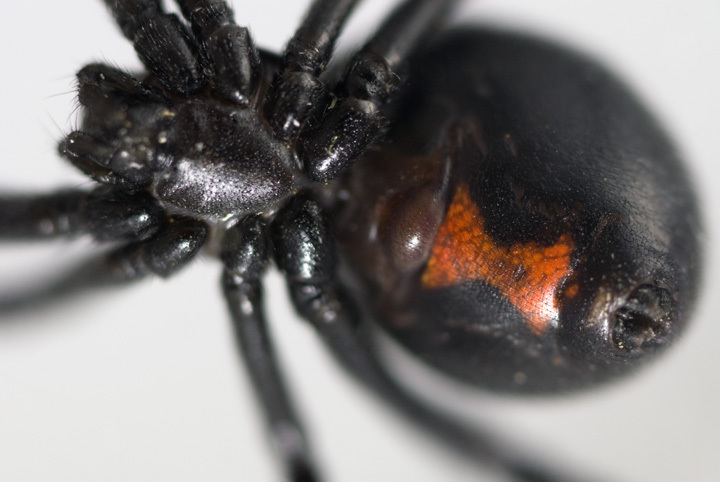 black widow spider venom was found to contain a peptide that could be used to treat Alzheimer’s disease. In Australia, research conducted in the venom of the spider Funnel Web is considered one of the most deadly spider man, such as pain relievers. The poison of a spider from South America are studied as a possible tool to help prevent heart fibrillation, which often leads to death when a person suffers a problem with the heart. Wowza. Well, it’s good to learn something new everyday. Still folks. Have no fear. I’ve no intentions of mounting a Save The Black Widow crusade any time soon. ← Harold…It’s time to get out of Dodge! Oh…. That would be a resounding no Gregorio! But one has to wonder about that giant’s cancer curing potential ….